My husband is a lucky guy. I mean, there is the obvious, of course: The JACKPOT of a wifey he found himself and those angelic angel-y angels of children she cooked up for him and all that jazz. But he is also rich in the friend department. He has this core group of best friends that he has had since Freshman year of college. They fight and cry like little girls sometimes, but they have remained pretty tight over the past 13 years or so. But here’s my secret: I am totally jealous of their friendship. My closest friends live in the following cities: Paris, Boulder, Boston, Washington, D.C. and New York. Like, one per city basically. I love people in general, but am not super good at maintaining friendships when we move away. So far, it seems I manage to average one long-term friend per city after moving. Meanwhile, my husband does NOT love people in general. (He actually strongly dislikes about 99% of people on this planet according to my observations.) Yet he has managed to remain close with the same group of guys for a gazillion years no matter where any of them have lived. Suddenly, they all live in New York. They are like kids in a candy store. Or boys in a bar. Yeah, that’s more fitting. Or just plain old literal. So, what comes with a barrel of handsome, successful men living in NYC????? Fancy girls, that’s what! And these guys really know what they’re doing. Ralph Lauren, Anthropologie, Glamour, Macy’s…just a few employers of the ladies on these gents’ arms. And they ain’t workin’ the cash registers at any of those establishments, if you know what I mean. And then there’s Michael. If you’ve ever checked out my Sites I Love page, you’ve already seen his stuff. He’s a pretty fantastic artist. So he found himself a pretty fantastic international fashion designer, Paola, and he proposed to her. And now she and I are stuck with each other. For life, if all marriages and friendships involved have the shelf life I think we all hope for. But it’s cool, because, you know, she’s aight. She’ll do. If you like funny, successful, pretty girls who share your love of cooking. Which I do. 1. I put off cleaning the floors until the last minute and didn’t actually complete the task before they arrived so that the Swiffer could be elegantly hanging out in the middle of the hallway when they came upstairs. That way they felt comfortable (eh, maybe forced) to leave their shoes on to avoid all milk and juice spills tie-dying the floor. 2. When they arrived perfectly on time I looked at Michael with wide, frantic eyes and said, “Ohmawgawd! I can’t believe you are here on time! Nothing is finished and I still need to jump in the shower! You have never been on time to one of my dinner parties! I figured you would be 2 hours late like usual so I thought I still had time!” I know. This one is *almost* rude, but I saved it by awkwardly apologizing 5,348 times afterward. 3. As soon as they came up to the apartment and were offered a drink by my husband I actually did jump in the shower. What? You’ve never had your host take a shower once you arrived? 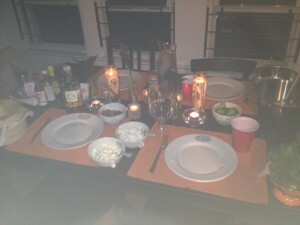 At a four person dinner party? Well, I am sorry to hear you have been missing out on such courteous and appropriate treatment at your social events. You should come party at my house. 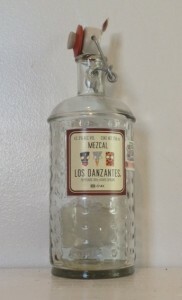 Mezcal is like that friend that is tons of fun but with whom you know you shouldn’t hang out too often because trouble is never far behind. Smoky, intense and likely to get you pouring out your deepest darkest secrets. In short: sip, don’t shoot. I took exactly one photo during the dinner party itself. I just wrote and erased 4 excuses for that fact. They were all lies. 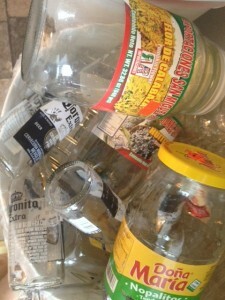 The truth is that I just got caught up in all the beer and hot sauce and guacamole and Juanes. I’m easily distracted when food is involved. One photo and there isn’t even any food on the plates yet and the lighting is fuzzy? Yes. We are talking about a gal who took a shower after her guests arrived. Clearly I wasn’t on my game, folks. And here is the huge secret that permits you to create such a huge feast on a Wednesday night: most of the ingredients are purchased pre-made. Oh, and make friends with someone who grew up in Mexico and have them cooking by your side. The huitlacoche and flor de calabaza can be purchased in jars. You simply warm them up and let people put as much as they want in their tacos. 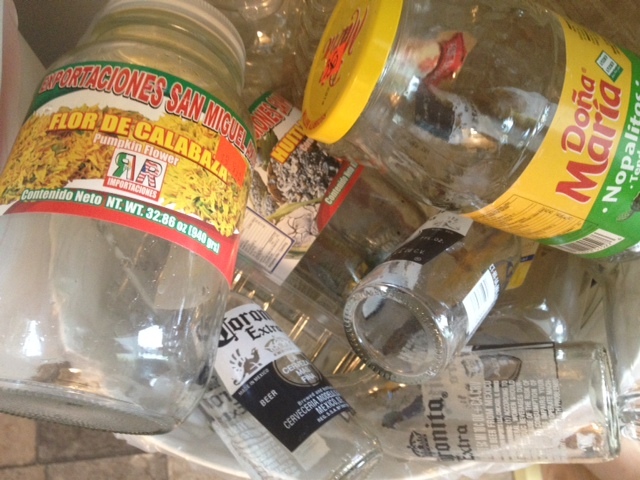 Our recycling was like a Who’s Who of a Mexican grocery the next morning. Paola brought still warm (drooling over here) frijoles from her favorite Mexican Outpost here in NYC, Mexico 2000, but you can also buy a can of refried beans and cook them with some onions and milk and Voila! you are the Mexican 70/30 Semi-Homemade Sandra Lee! We just pulled apart the Oaxacan cheese, put it in a ceramic pot and plopped it in the oven at 300 degrees for However Long It Happened To Take To Warm Up Everything Else minutes. Or until it melts. Whichever comes first. Use yer noggin. Let’s see…what else……oh yeah! Tortillas! You can warm them up in damp paper towels in the microwave for about 11 seconds (Yes, *about. * Shut it.) Or, if you live in the Dark Ages an old-school Brooklyn neighborhood like us and don’t have a micro, you can just put a pan or griddle on low and lay them in it, flipping until warm and pliable. No butter or oil. You there. Put it down. Not kidding. Leave ’em alone. 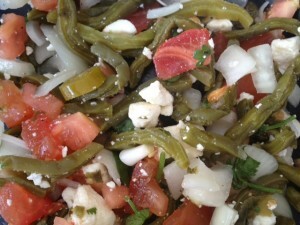 So, that leaves me with the one true recipe I am giving you on this What’s For Supper Wednesday: Ensalada de nopalitos. Oh, and I guess I still have to do my appendix or glossary or footnotes or whatever that stuff is that you put at the end of a BOOK. Seriously, is this not the single longest blog post I have ever written?!? 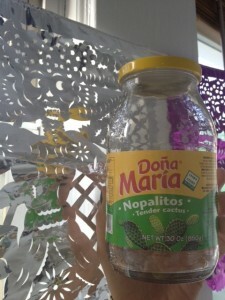 Before you embark on this recipe, I figured I’d show you an example of what to look for when finding a jar of nopalitos. Because I am an idiota, I didn’t take the picture until after emptying the jar of it’s distinct contents. 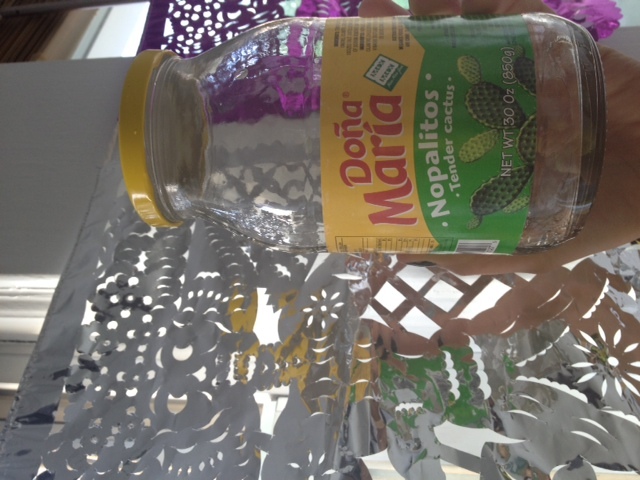 To make up for being such an idiota I composed the jar oh-so-lovely-y with some papel picado. There will not be a ‘katrina skeleton of death in a good way’ staring at the jar on the shelf. Well, there probably won’t be anyway. Don’t want you getting all confused at the store and not walking out with any nopalitos just because there was no skeleton. Mix everything together in a bowl or serving dish. Squeeze 1-2 limes (keep tasting and stop once you can taste the lime, but it still isn’t overpowering) over everything and mix it together. Mix in some salt and pepper. Crumble queso fresco on top. Annnnd, now I want more. I hate when I look at food pictures of things I don’t yet have ready to eat in my fridge. Also, after bashing Giada pretty good I feel like I owe you an apology for how damn easy this recipe is. Although, in my defense, at least it is an actual recipe. Toast is still not a recipe, de Laurentis, ya hear? Please enjoy your Mexican Feast any day of the week, with as many people as you can fit in your home, and with plenty of Juanes and Juan Gabriel blasting. I guarantee it will be impossible not to have a good time. I do. I guarantee it. Up there with death and taxes. 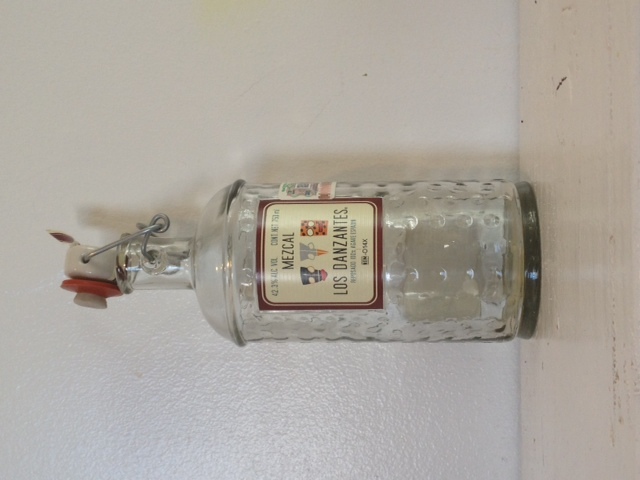 This entry was posted in What's for Supper Wednesdays and tagged bad hostess, ensalada de nopalitos, feast, flan, flor de calabaza, frijoles, fun dinner party, huitlacoche, Juan Gabriel, Juanes, Mexican, Mexican Semi-Homemade, Michael Kagan, Paola Hernandez. Bookmark the permalink. Follow any comments here with the RSS feed for this post. Post a comment or leave a trackback: Trackback URL. 7 Responses to Mexican Feast…Estilo Rapido! Sounds delicious. And I’m sure your guests appreciated the shower, even if it kept you from entertaining them for a few minutes. Better to be known as the tardy one than the filthy-in-a-bad-way one. Hint from Heloise: If you are alone with the kids and need to shower and you don’t want the kids to end up fighting with steak knives over who gets to turn the stove burners on first, stick them in the shower with you. Or is that icky when your older kid is a boy? I have also made Cleo sit in the bathroom and “read” while I shower. Momma’s gotta get her weekly shower in sometime. I’ve never had Ensalada de Nopalitos, but that picture looks a lot like ceviche. Summer is totally ceviche season. You got a good recipe? I will try some of these “recipes”! I have upped my weekly shower to TWICE a week showers. (I know, show-off, right?) And we DON’T even have a live-in nanny! I just started showering when Xavi naps and letting Carlitos watch TV. It would take a real live dinosaur entering the room to get that kid off the couch once TV is on, so I feel pretty safe about it.